We have specialist in-house knowledge and methodologies to identify and map koala habitat, as well as the distribution of free-ranging koala populations across the landscape. We have expertise in the preparation of site-specific and Shire-wide (Comprehensive) Koala Plans of Management, while also being capable of informing and undertaking Population Viability Analysis (PVA) for koala populations. Using a sampling tool called the Spot Assessment Technique (SAT) we have developed an unbiased and systematic approach to the matter of objectively assessing koala habitat. 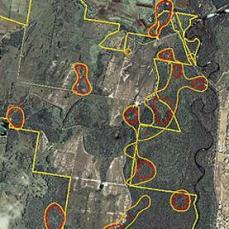 Called Regularised Grid-based Spot Assessment Technique (RG-bSAT) sampling, the technique enables koala habitat and population assessments to be undertaken across large areas. The data we obtain allows us to determine several things including localised food tree preferences and even koala population density (and hence population size), while also providing key information on exactly where koala populations are located across the landscape. How reliable is the modelling? Over the last decade RG-bSAT has been applied along the eastern seaboard of Australia from Raymond Island and the Strzelecki Ranges in Victoria to the Liverpool Plains and Brigalow country in the central western parts of NSW and Qld, to more densely populated areas such as the Gold Coast in south-eastern Queensland. On average, modelling captures 85 - 90% of contemporary koala records. Most importantly, the boundaries invariably capture 100% of breeding females; this is a significant outcome that allows us to be confident that the approach clearly delineates the most important habitat areas. Why is it also important to do population and health assessments? An understanding of the distribution of age classes within a given population is fundamental for effective conservation and management planning. Ideally, what we hope to find is a population at demographic equilibrium with age classes that are approximately normally distributed (i.e. 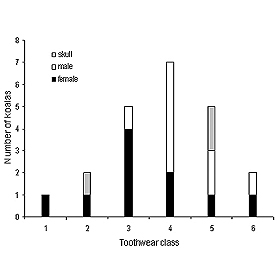 the majority of a individuals in a given population belonging to the middle-aged tooth wear classes). If the age-class distribution of a given population is skewed to the right (of normal), then we know that the population is mostly comprised of older animals and hence recruitment into the population is probably a key issue. This leads us to develop management actions and/or guidelines that can effectively redress the imbalance. Conversely, if the age-class data is skewed to the left, it tells us that the population is largely comprised of young animals and hence likely to be in a positive growth mode. How do you tell how old a koala is? We examine and grade the amount of wear evident on the pre-molar and molar teeth. 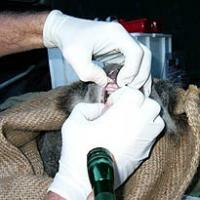 This procedure is invariably undertaken using a mild sedative or anaesthetic so as to minimise stress. How do you catch a wild koala? Unlike Government agencies in Victoria and South Australia, we won't use nooses to capture koalas because we consider the approach unethical, unnecessary and traumatic. Instead we use either a flagging technique (cloth attached to one or more extendable poles) to encourage a descent to the ground, or alternatively, a custom designed koala trap. Both are very effective techniques and allow us to gather meaningful data in a manner that is both time and cost effective, but which also causes minimum stress.